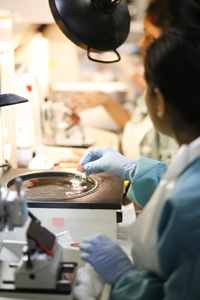 The Department of Pathology at Montefiore Medical Center is one of the largest and most comprehensive medical center laboratories on the east coast. With a staff of nearly 700 associates and more than 50 pathologists and PhDs, our laboratories perform more than 10 million laboratory test results, interpretations, and diagnostic consultations each year. It has been estimated that about 70% of medical decisions involve lab testing run by pathologists. The life of a pathologist is about more than just reading slides and writing reports. In addition to overseeing blood banks, practicing transfusion medicine and ensuring that the blood supply is safe and used appropriately, pathologists examine blood cells to determine cholesterol levels, examine tissues for such diseases as cancer, identify microorganisms that cause infections and test the reaction of infecting bacteria to different antibiotics. Although they work behind the scenes, pathologists are essential to the roles physicians play in their patients’ lives. The Department of Pathology also houses Montefiore Medical Laboratories (MML), which serves as the reference laboratory to many hospitals and clinics in the community. Montefiore Medical Center is one of a select few hospitals in the New York metropolitan area offering reference lab services to the medical community. We are also actively involved in the community, training nurses in our School Health Program to bring the highest quality of clinical pathology care to students of all ages.